Free Comic Book Day (FCBD) is a glorious celebration of our passion for paneled images and comic book awesomeness. This year, I attended FCBD at Flagstaff’s Cab Comics across the street from Bookmans Flagstaff. Our mighty superhero Book Man brought delight to the denizens and comic addicts of Flagstaff. Me about to get offed by a Tusken Raider. Actually, he was quite funny and had sounds effects for greater effect. We arrived early to set up our table and organize our swag. Already the hungry masses lined up outside Cab’s front door ready to dive headlong into free comic glory. Cab’s owner, Cory Bushnell, was prepped and ready for the glorious invasion of customers before the opening. He’d been at the store at four hours earlier putting out hundreds of free books. Right after we arrived, a couple of dudes entered the store with large cases and went straight to the Cab’s backroom. These Star Wars role players inhabited a fully-outfitted Imperial Stormtrooper persona and the other a Scout Trooper. These troopers went the distance with their detailed costumes. 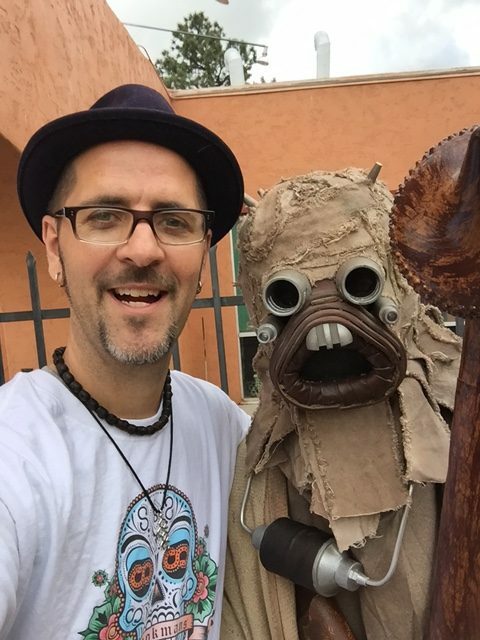 In addition, we saw cos-players who dressed as a male Tusken Raider and a female Tusken. They also went the distance with their costumes, which included vocal sandpeople effects. As the long line of customers poured into Cab, they headed straight for the two large tables packed with all sorts of comics. When Book Man appeared, he was greeted by the delight of many kids who attended with their parents. For the rest of the day, there were photo ops with Book Man, the Stormtroopers and the Tusken Raiders. Cab Comics was packed with comic fans. A few kids also dressed in costumes and posed for pictures with Book Man. FCBD was a success and I met many people, passed out lots of stickers, entertained kids and enjoyed a enlivening day. Thanks to everyone who made it a day to remember, especially Kelsey, my geeking out partner at the event. I look forward to next year. Maybe I’ll don a costume of my own.